Kathleen Phillips and Katie Crown make funny, funny music together, creating comedy sketches almost entirely sung acapella. Tonight, the duo perform a special holiday edition of their show. Mirthful melodymakers Kathleen Phillips and Katie Crown sing their sketches tonight at the Flying Beaver Pubaret. Detail of an image by Chris Locke. Phillips & Crown Holiday Climax Blowout Spectacular!!! Friday, December 30, 7 p.m.
Phillips and Crown has been lauded in the past for their quirky little operettas; a previous show, Our Lives Work, has been occasionally staged, usually for small, one-night-only performances. 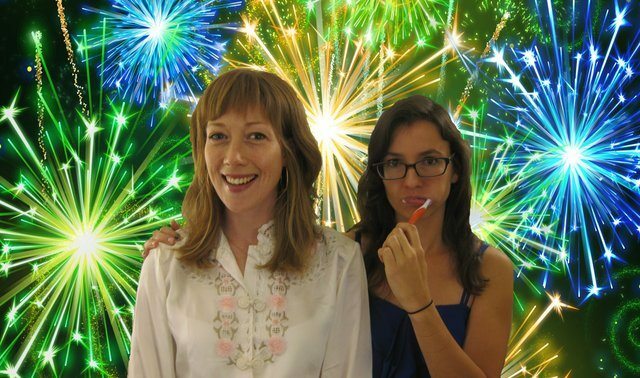 But the duo have bigger plans for their idiosyncratic project in 2012; Torontoist talked to the two comedians about tonight’s special, and their future melodic escapades. Torontoist: So, will this be another performance of Our Lives Work? Kathleen Phillips: There’ll be a lot of the same sketches, but there’s also going to be some surprises—holiday-themed surprises! Phillips: And there’s more people involved—Lex Vaughn is opening for us, we’ve got special appearances by Emile Mover, and The People of Canada. It’s a festive and communal sort of event. How large is the Pubaret? Crown: It’s “Pubaret”? I thought it was “Pubearet”! Phillips: [Laughs] You keep calling it that! It isn’t such a rude place, Katie! It seats about 60; it’s a nice little theatre space. Crown: I was, like, “Flying Beaver Pube-aret?” Guys, I’m the dirty one… It’s “Pubaret”? It’s a pub, and a cabaret space. Let’s talk about where the Phillips & Crown musical comedy style came from—it’s pretty unique. Kathleen, you were in Maggie McDonald’s rock opera The Rat King, with people like Laura Barrett and Gentleman Reg. And in The Remainders, Katie, you did all sorts of musical numbers as a vaudeville act; you’ve always been the sort of person who breaks into song at the drop of a hat—like, in conversation, even. Crown: [Trilling] I do… Well, Kathleen and I did a lot of musical numbers in children’s theatre, with Cow Over Moon. Phillips: Yeah, the first show I ever wrote songs for was Puss in Boots, which was the first Cow Over Moon show Katie was in. And then, there was a show format at Laugh Sabbath, an early version of Talent Show, that was all duos, and we wanted to work together—so we came up with this musical number about a nightwatchman who falls for a mannequin. Crown: We had so much fun doing that, we did another, and another, and soon, we had enough for a full show. Are you both really comfortable singing on stage in front of people—especially acapella? Phillips: Yeah, it’s a lot of fun, and very freeing. Crown: I find it very comfortable, this style we’ve found for ourselves. Without depending on instruments or a backing track, it leaves us room to play within the sketches, with the pacing, and surprise each other. Phillips: Katie’s really good at harmonizing—I’ll sing the tune, and she’ll come up with these great harmonies based on the key we’re in. Do you blow a pitch whistle before going out on stage? Crown: Nah, we just go for it. I wondered how long before you’d sing in this interview, Katie! Crown: [Still laughing] Well, y’know… it’s just the most fun we’ve ever had on stage. Katie, you’re only in town for a little while, before heading back to Los Angeles. Crown: Yeah. I like it out there, more than I thought I would. And there’s a lot of other comics there from here—Laugh Sabbath alumni, like Holly Prazoff, Rebecca Addelman, and Ingrid Haas, who are all in The Get Go. Will Phillips and Crown be performing there in the New Year? Phillips: Yeah, I’ll be there in January, and we’ll be performing at the Steve Allen Theatre. And while Katie’s here, we’re recording—we’re planning on turning our blue Mexican Wrestler action figure and toy moose characters into a cartoon series.